Today I am making a mixed paella. 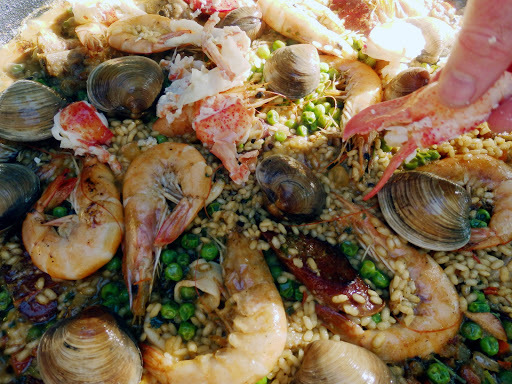 I had been thinking about paella for several weeks, but it was not really my plan for today. Last evening I went to the market to get some fish for dinner. I got a really nice 3.5 pound red snapper for the grill. 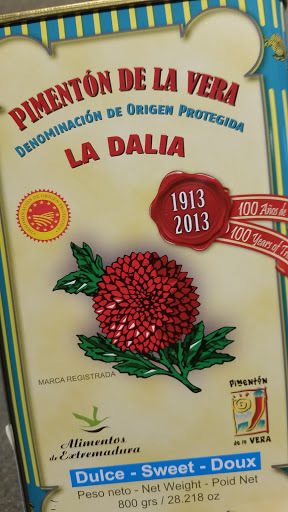 I also got a bunch of other items to make my mixed paella. 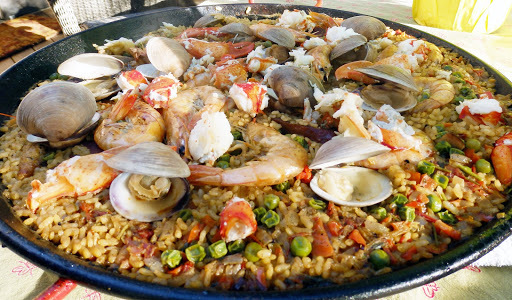 This type is paella is what we often see in American restaurants. 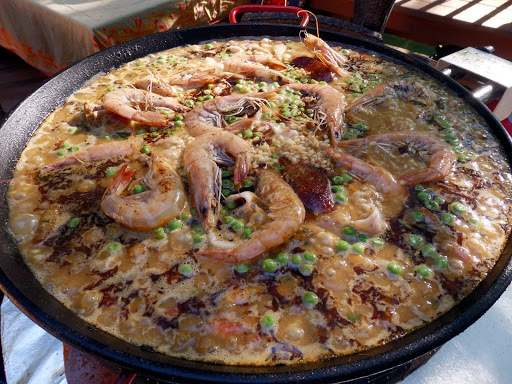 In Spain, the paella tends to be focused more on one or two of the ingredients. The rice, however, is always the star of the show. I do keep a supply of Bomba rice on hand for paella so I can make it when I want. This traditional rice is one of the hardest to find ingredients here, and it is one of the costliest. It is worth seeking out. In 2000 traveled to Spain for work. One of our group’s hosts insisted that we go to a special place for paella. It had to be ordered a day in advance. I was certainly up for that. My one colleague, however, was less enthused. He had begged me to take him along on the trip, which included Naples, Sicily and Spain. The first night in the Mediterranean region, I was informed he does not eat seafood. You’ve got to be kidding me! So here we are in Spain, going to the locals’ recommended spot for paella, and this guy is whining they need to make him a “meat paella.” Our host, eager to please, says he can be accommodated (but he is extremely puzzled why this guy would not just go with the flow). The next day, we are told we will have a “real” paella and a smaller “meat” paella for my picky co-worker. We went to the paella place at 5pm. Of course it is empty since no sane Spaniard eats at that hour. We are seated at a long table where we can peer into the kitchen and watch our paella come to life. It all looked and smelled great. My colleague is wondering where his paella is because all we can see is seafood. I note that they are making a huge paella for the group, and then a much smaller one on the side. The smaller one, I tell him, must be for him. 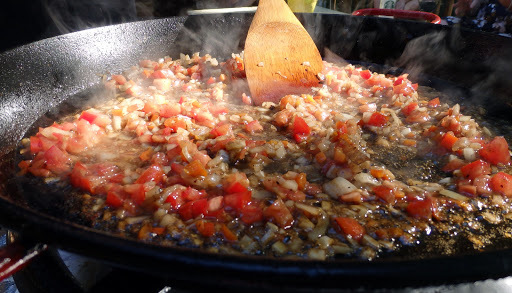 The two paellas are served with a flourish, and they both look the same. My co-worked freaks out. Where is his meat paella? 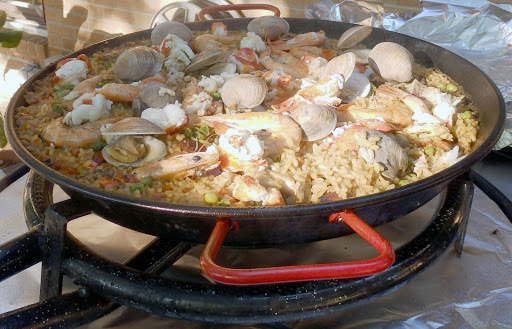 I inspect the small paella a bit closer, and see it has pieces of chicken, sausage, and pork in addition to the seafood. 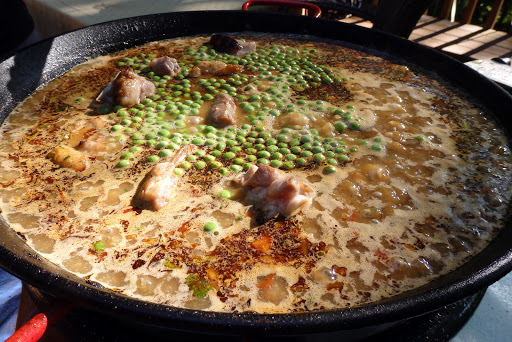 There, there is your “meat paella”! All of us but him had a great laugh. In the end, we all left full and happy…still well before any Spanish diners were on hand to see our spectacle. My next trip to Spain, I brought home my own paella (the pan is actually called a paella) along with a butane burner to fit the pan. I had my suitcase stuffed with this cookware, bottles of Spanish olive oil, Spanish brandy, anchovies, saffron, paprika, and who knows what. I had to get my bag rechecked through x-ray at JFK. I will never forget the look on the security guy’s face when he saw the image. He looked at me and said, “You’ve got booze and a stove. Open it up.” No problem. My loot made it home safe and sound. I did have to modify the butane burner for propane, but all is well. 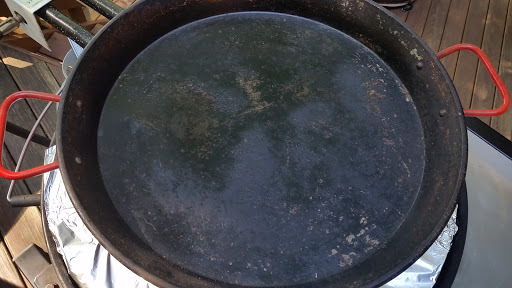 My paella is about 18 inches in diameter. This is a good size to feed about eight guests, give or take. The preparation of my paella started with grilling that red snapper. I took the bones and head of the fish and made a basic bone stock. 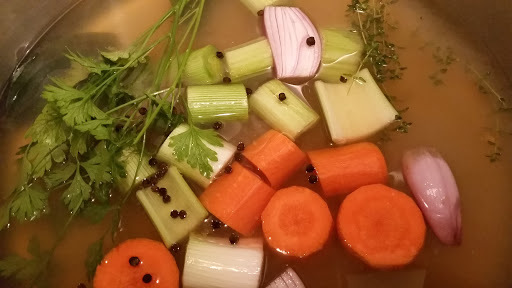 I removed the bones and added some dry white wine, shallots, leeks, carrot, celery, bay leaves, fresh thyme, parsley, and black peppercorns and let them simmer. Then I used that stock to cook two 1-1/2 pound lobsters. I removed the meat from the lobsters and returned their shells to the pot. Simmer a few hours and then strain the stock. Delicious. Next step was to prep all of the other ingredients. For the proteins, I already had the lobster meat, claws left intact and tails cut into bite size. I also had some pork ribs cut to about 1-1/2 inch length. I used about 12 pieces. I took four chicken thighs with bone and skin and cut them into 5-6 pieces each with a cleaver. Head-on jumbo Gulf shrimp (3/4 pound) just needed to be rinsed. Three fresh squid (3/4 pound) were cleaned and cut into ½ inch rings. All of these were sprinkled with a little salt and put in the fridge. A 7 ounce Spanish chorizo cut into ¼ inch slices. Last was a dozen littleneck clams washed and returned to the fridge. I would have added mussels, too, but could not find any to my liking. If you have some, a dozen cleaned in their tightly closed shells will be great. I measured out three cups of Bomba rice and added 2t sweet smoked Spanish paprika. 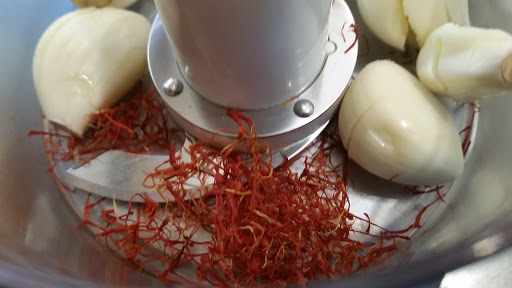 A paste is made from 8 cloves of Rocambole (hard neck) garlic, 3T chopped parsley, and ½ t Spanish saffron. ½ cup peas are placed in a bowl and set aside. Then a sofrito is prepped. 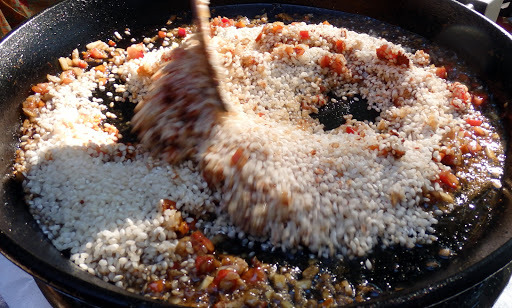 One bowl has a finely diced fresh red Anaheim chile with two finely minced medium sized Spanish onions. Another bowl has a finely diced ripe tomato (a bit larger than my fist). The fish stock, about 8 cups, is placed in a pan on the stove over low heat to warm it up. Now to assemble the dish. Heat 3-4 T good olive oil in the paella over medium heat. 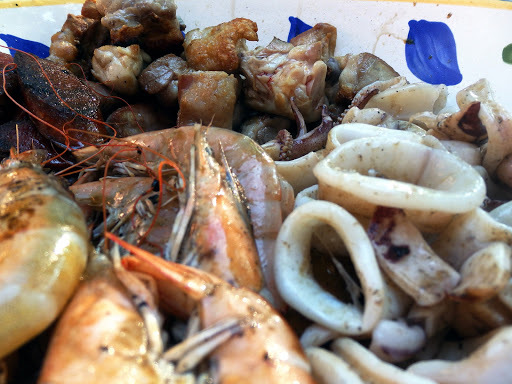 Sear, in succession, the chicken, pork, chorizo, shrimp, and squid. Do not cook them through, just get a nice brown crust on the land meats and a quick sear on the seafood. After each is seared, remove to a large platter or pasta serving bowl on the side. Add a bit more olive oil to the pan. Cook the pepper/onion mixture until it is translucent. Add the tomato and cook for another minute. Add the rice/paprika mixture and stir until the rice is well toasted and fragrant. Add the fish stock to the pan along with the parsley/garlic/saffron paste. Stir until the mixture comes to a boil. Add in the chicken, pork, chorizo, and squid. Add the peas. Stir to mix. Reduce heat to a simmer. Arrange the shrimp, lobster meat, and clams on top of the rice. 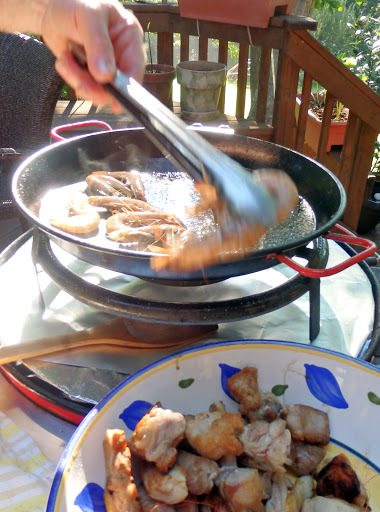 Cover the paella with foil and reduce heat to very low. Let it cook about 20 minutes until all of the stock is absorbed. It’s ok if the rice forms a crust on the bottom. After 20 minutes, I lift the foil and push some of the rice aside to see if the stock is all absorbed. If so, I take a small spoon and taste some of the rice for doneness. Remove the foil and serve the party with pride. It’s an impressive dish, definitely worth the effort.